Ocean-View home newly furnished with remodeled Home Theater Room with 82" TV. Ocean Views from the Living Room, Balcony and Master Bedroom. Situated on a hill overlooking Dana Point, this tri-level home is a short walk to Strand Beach. The recent kitchen remodel features all new appliances, gas stove, granite counter tops, new cabinets, and beautiful island with wood top. Ample living space with over 2200 square feet, this home comfortably sleeps 8 in 3 bedrooms, with private master suite on the top floor. Backyard is completely fenced and private. Be among the first to enjoy this newly renovated home with all new furnishings and great ocean views. Take an easy walk to Strand Beach. Comfortable surroundings for the entire family with a spacious back yard and plenty of room for everyone to spread out. This 2200 square foot home features a newly upgraded kitchen, dining area, living room and 3 bedrooms with 3 bathrooms. Ocean views from the Living Room, balcony, and Master Bedroom. The first floor features a Home Theater Room with bathroom and wet bar. Enjoy your favorite movies on this 82" 3D TV. Netflix and all premium cable channels are included. Walk up a flight of stairs to enter the main level and the Living Room with gas fireplace and a view balcony. Living room is equipped with a sleeper sofa to add sleeping accommodations for 2 more. Large flat screen TV. The large-size kitchen features all new appliances and the combination dining area looks out to the landscaped backyard. Barbecue grill and patio furniture make it easy to have dinners outdoors. Ample parking in the 2-car garage with additional driveway and street parking. The home is less than a mile to the world class resorts of the St. Regis and Ritz Carlton hotels. Less than a mile to world class golf and tennis facilities. 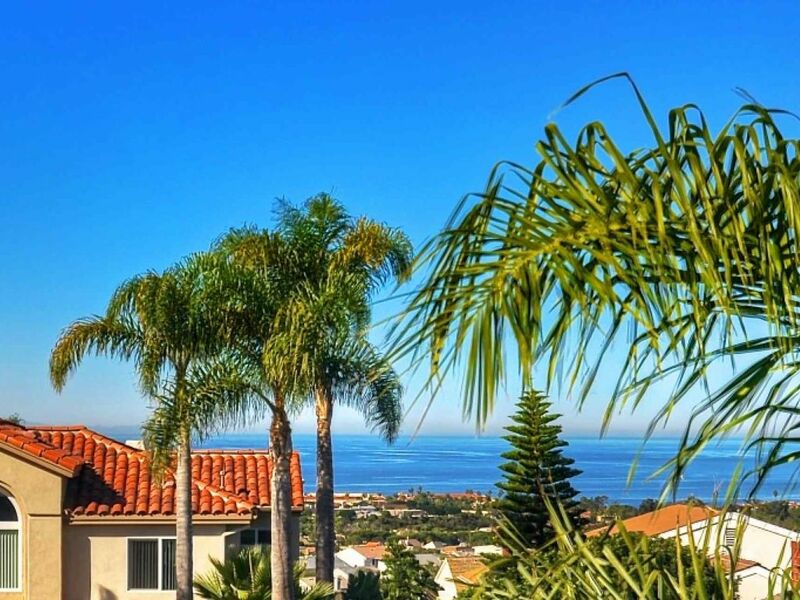 Dana Point allows easy access to Los Angeles and San Diego and all major tourist attractions. Dana Point Harbor (2 miles south) offers every kind of water sport imaginable from sailing to paddle boarding to whale watching. Learn to surf at beautiful sandy Strand Beach. We have been staying in this home during the month of January for 3 years in a row now. We love its location, so close to the beach and enjoy walking to and from. The beautiful sunset views that you can see from the master bedroom windows are a great plus. The most important thing to the two of us is a quiet place and one that is comfortable seeing as during the winter months we spend more time indoors. This place is in a very quiet neighborhood and has very comfortable furniture. We especially like the home theatre room with the comfy recliners and the living room is great for having friends over. We like to cook and the kitchen is awesome! Carla is wonderful to deal with and very responsive to every need. We will be back next year again for sure! My family had a great time at the Dana Point Trip-level home. Our family stayed for 7 nights and enjoyed being together in the Kitchen, living room and downstairs movie room. Everything worked well and Carla was very helpful with answers to our questions. There are good instructions for the home and the technology such as wifi and TVs etc. We cooked most meals in for 8 of us and the kitchen is well stocked and laid out nicely. Beautiful home, great location, something for everyone! Our family rented this home for the week of Christmas and absolutely loved our stay. There was an abundance of space, an amazing kitchen, a nice patio with fire pit, and great views of the ocean and sunsets over the area. The Media room was a wonderful way to watch football and movies! Comfortable beds and a beautiful fireplace. This may not be the place for older adults due to the many flights of stairs. I've only removed a star for the perplexing lighting and light switch positions in most of the rooms and the wear and tear on a few of the theater room seats. Otherwise, it was perfect. Highly recommended. Thank you for this feedback. I will see what can be done to improve these issues. My family and I were in a situation where we needed a place to stay while our house was being remodeled. We absolutely loved staying at this condo. It had everything we needed for my family of 5. It was comfortable, cozy and loved walking down to the beach. Carla was very helpful to us. Carla was fantastic and helped up figure out what would suit our needs best. The locale is easy and a short walk to the beach. The house is nice. Master comfy. It would be a good spot for a family the way it is laid out and the theater room. The condo was well appointed and comfortable. Carla met us at the house and oriented us to the use of the televisions which have the same apps we enjoy at home. She was very accessible for my questions before, during and after our stay. Best of all, she returned of our $1500 deposit withthin the seven days that she promised.Should we return to Dana Point I would look for a VRBO that she manages. Major Credit Cards Accepted. Monthly rates show the rental amount of a four week trip. A 35% deposit is required upon confirmation of all reservations. Local, State & Federal Taxes 10%. Processing Fee $49 per trip. Refundable Security Deposit $1,500 per trip refundable after cleaning and inspection.